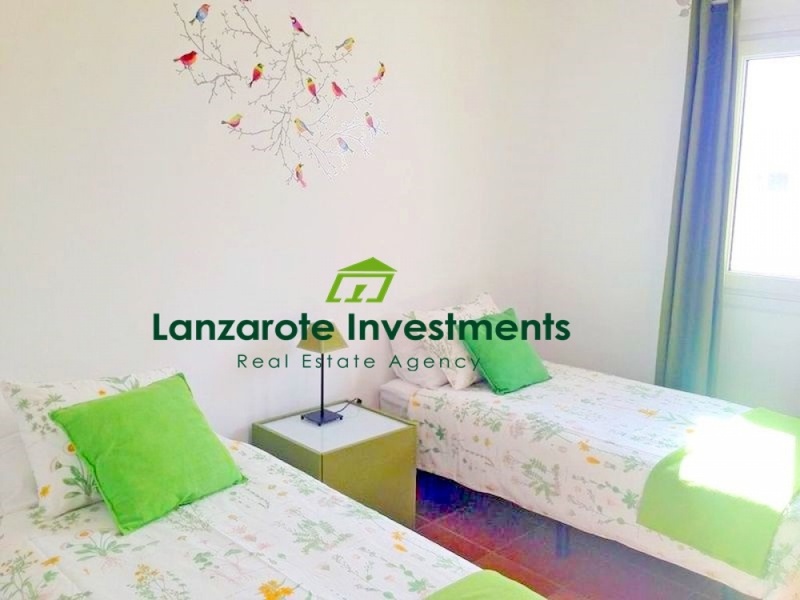 The property is located in a quiet urbanization in Playa Blanca, just a walk away from the town centre and beaches. This ample villa is constructed on a large plot and consists of a ground ﬂoor and a basement. On the ground ﬂoor, there are an extensive lounge with independent kitchen as well as 3 bedrooms and 2 bathrooms, one of them en-suite. The kitchen connects to a spacious covered solana. The basement of 83 m2 has been reconstructed into an additional apartment with a bedroom, a bathroom and its own lounge. The private pool is surrounded by an extensive tiled terrace with high walls and wonderful views to the Femes Mountains. The spacious terrace oﬀers space for sunlounges and dining area. There is also a built in barbecue and a trampoline. At the front of the property there is a private parking. The property is a good opportunity for those who wish to rent it out and to receive the substantial rental income.